Details: Sarah Briscoe is an ex-professional classical ballet dancer who was trained at The Royal Ballet School, performed as the lead ballet dancer for Andrew Lloyd Webber’s “The Phantom of the Opera” and joined the English National Ballet for two seasons for “The Sleeping Beauty” and “Romeo & Juliet”. 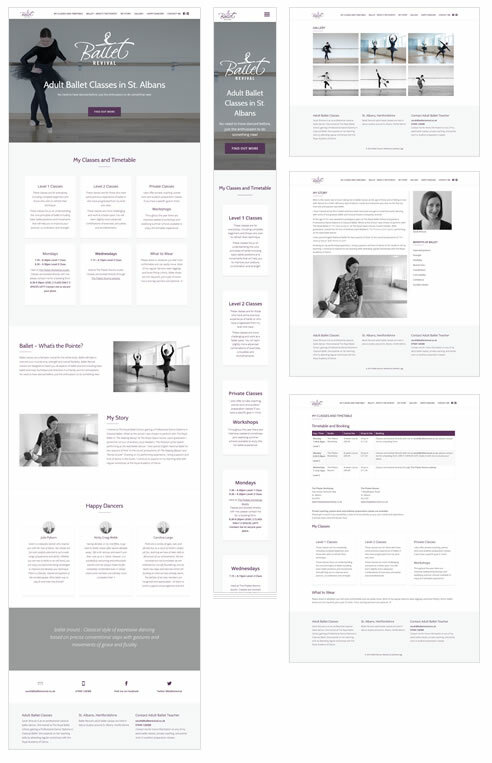 Having since worked in Marketing she knew when it came to setting up her own business Ballet Revival, running adult ballet classes in studios around St. Albans, Hertfordshire, how important a website would be. As a start-up Sarah’s budget was tight but together we agreed on a package that gave her the look she wanted, matched with the ability for her to update her own content so she could keep on top of promoting classes in her growing business. The website is built using WordPress with a customised BootStrap theme, so is Responsive and works well on mobiles (important for the ballet dance on the bounce! ).